Hello to all Bolognese Lovers. 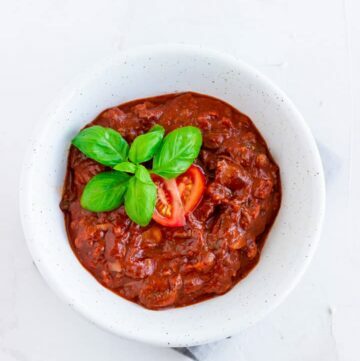 This vegan bolognese made with mushrooms and walnut is so damn delicious, not even an omnivore would miss the meat in it. The combination of the chewy mushrooms and crunchy walnuts, seasoned with some different spices, are the perfect companion for your next pasta evening. 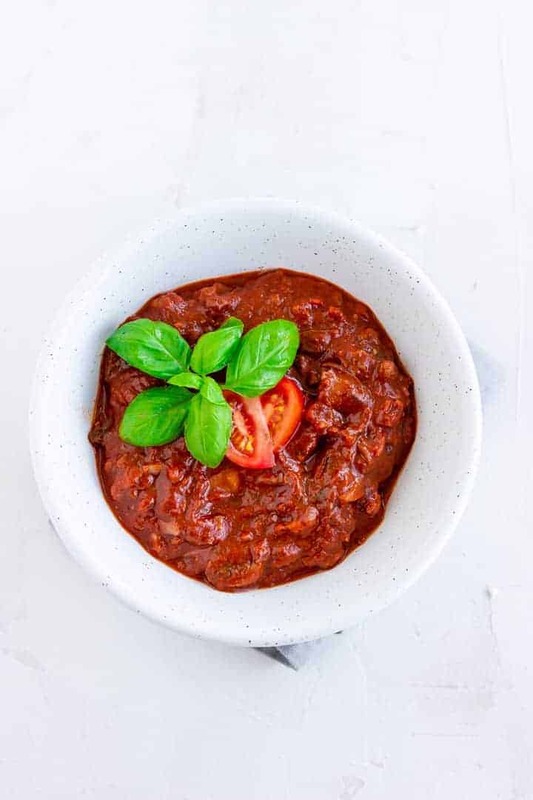 I love the fact that this vegan bolognese is only made with plant-based ingredients and is so tasty, that I always overeat myself and cannot move afterward. There are some great vegan “minced beef” substitutes you can buy in the supermarket, but as I do not like highly processed food, I prefer to make one from scratch. 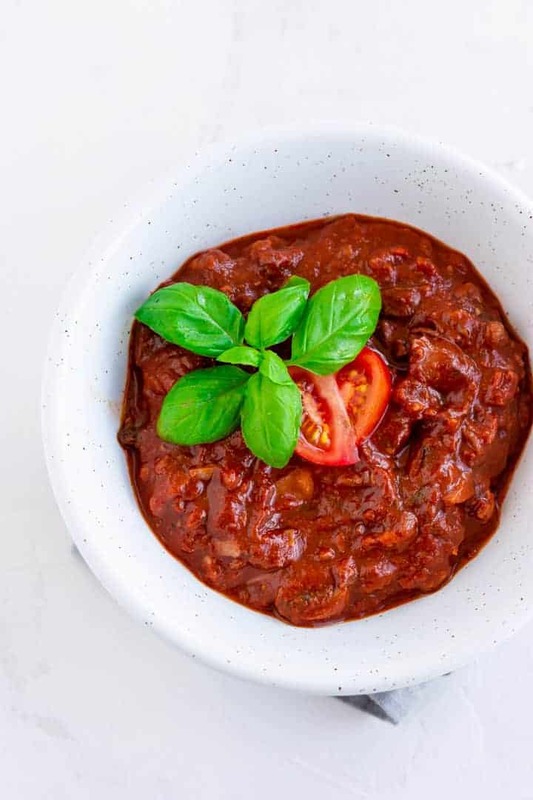 And this recipe for vegan bolognese with mushrooms and walnuts is truly great. A vegan bolognese made with mushrooms and walnuts. It's simple and does taste super delicious. Roast the walnuts over medium heat and chop them in your food processor or by hand. Set aside. Peel and mince the garlic and onion. Cut half of the mushrooms in strips and the other half in slices. Roughly cut the tomatoes. Preheat a large non-stick pan or dutch oven with one tablespoon of coconut oil. Cook the onion and garlic for 3 minutes. Add the mushrooms and cook for 8 minutes. Mix in the apple vinegar, tomato paste, herbs, chopped tomatoes, sambal oelek and stir until well combined. Add the tomato passata, half of the red wine, and chopped fresh basil. Let it cook for 30 minutes. Add the other half of the wine step by step during cooking and stir occasionally. Add the chopped walnuts and cook for another 5 minutes. Meanwhile, cook spaghetti in boiling salt water. Season the bolognese with olive oil, salt, and pepper and serve it with the spaghetti. 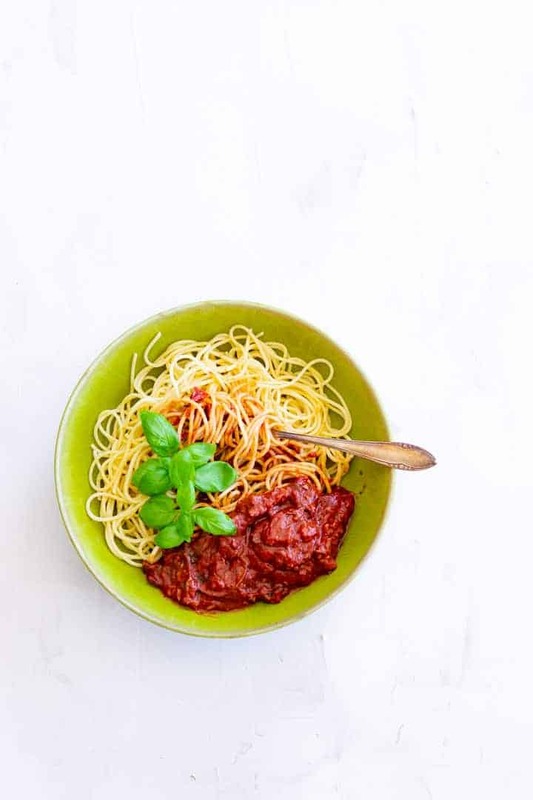 You don't have to eat it with spaghetti, choose your favorite kind of pasta to serve it with. Keep it for up to two days in your fridge. Wow this recipe is really cool. I will make it using low-carb pasta and then follow your steps.